Damato (DD-871) was launched 21 November 1946 by Bethlehem Steel Co. Staten Island N.Y.; sponsored by Mrs. A. P. Damato and commissioned 27 April 1946 Commander I. S. Presler in command. She was reclassified DDE-871 on 4 March 1951. From her home port at Newport R.I. and after December 1947 from Norfolk Damato cruised the Atlantic from Cuba to Newfoundland in training and exercises. In the summer of 1949 she carried midshipmen on a training cruise to France and England and that fall joined in experimental cold-weather operations in Arctic waters. From September to November 1950 Damato had her first tour of duty with the 6th Fleet in the Mediterranean and during the next year joined in hunter-killer operations in the South Atlantic. She returned to the Mediterranean in the fall of 1951 the summers of 1952 1953 and 1954. In both 1952 and 1953 she joined in autumn North Atlantic Treaty Organization exercises in the North Atlantic and during the summer of 1955 joined a Midshipman Training Cruise to Norway and Sweden. Between October and December 1956 she served with the 6th Fleet in the Mediterranean and on 12 June 1957 was in Hampton Roads for the International Naval Review. 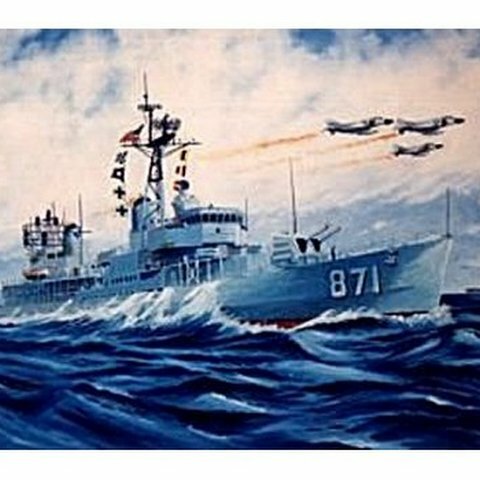 That summer she cruised to Brazil with midshipmen on board for training then sailed for the Mediterranean in March 1958. She patrolled off the Levant then passed through the Suez Canal to join the Middle East Force in the Persian Gulf returning to Norfolk for local operations in September. During 1959 she served with TF "Alfa " concentrating on the development of improved antisubmarine warfare techniques. She visited Quebec Canada in July and in August sailed north again to pass through the St. Lawrence Seaway dedicated a month previously. She called at Montreal at Rochester N.Y. and arrived at Toronto for the Canadian National Exposition joining the review of NATO naval forces taken by Admiral of the Fleet the Earl Mountbatten of Burma Britain's senior military officer. Returning home she called at Ogdensburg N.Y. and resumed east coast and Caribbean operations through 1962.